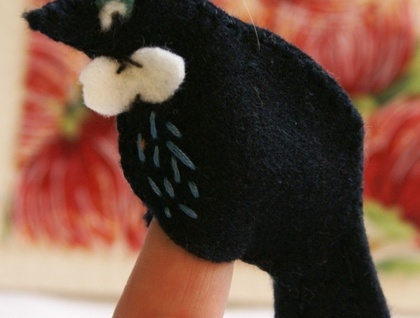 A removable Tui finger puppet attached to a card making a beautiful card and gift in one. The Tui, (a native bird in New Zealand) is hand sewn in felt and is the perfect little gift / toy for friends and family home and overseas. 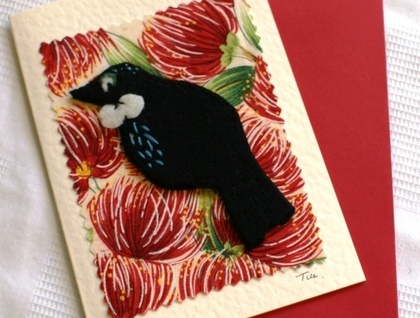 The Tui is mounted on to some beautiful pohutukawa fabric on a thick, textured cream card. Each comes with a red envelope. This would make a perfect Christmas card but is left blank so can be used for all occasions throughout the year.